Desert Slide is the latest project of the Indian slide guitar virtuoso Vishwa Mohan Bhatt. The former student of Ravi Shankar first gained international attention with his 1994 Grammy Award-winning album collaboration with Ry Cooder. And he straddles the cultures in more ways. It was his love for the characteristics of North American slide guitar that led him to invent the Mohan veena, a hybrid guitar with 19 strings which is now recognised as a true Indian classical music instrument. Desert Slide sees him collaborating with the internationally renowned Gypsy musicians of Divana from Rajasthan. The soaring tones of the Mohan veena intertwine with inspirational singing, mellifluous melodies of the kamancheh and ecstatic rhythms of tabla and dholak. A meeting of masters inspired by the vast expanses of the Thar desert. Not to be missed. "Desert Vision II : the spiraling sounds of the mohan veena intertwine with the vocal harmonies of Anwar Khan Manghaniyar, in a sort of long tracking shot through the desert immensity. Pandit Vishwa Mohan Bhatt claims his filiation with Tansen, master of music in Akbar's court (XVIth century). But he also composes and innovates, like Pandit Ravi Shankar whom he was the first student of or like his fellow musician Pandit Debashish Bhattacharya, who also shows a real interest in slide guitar. The creation of the mohan veena, half guitar half sitar instrument, with bluesy and hawaiian sounds, forces the player to go beyond the boundaries of traditional playing, also fascinating. As a grammy awarded for the project recorded as a duo with Ry Cooder in 1994, Vishwa Mohan Batt is one of the few Indian musicians who is known by Westerners. This former Ravi Shankar’s student manufactured the Mohan Veena, a guitar which combines the features of indian traditional string instruments with the ones of the north-american Slide Guitar, the most beautiful characteristics of which he keeps sublimating. For this project, this virtuoso, who is a native of Rajasthan, joined his gipsy fellow countrymen, the Divana, whose talents are today very well known. As part of the caste of the Langas and Manganyars musicians, who formerly devoted themselves to Radjahs, these artists met with success in Europe through the groups Divana and Chota Divana. In this project, they demonstrate an almost absolute grace thanks to the singing of the great Anwar Khan as well as the playing and the mastery of saranguis and percussions (tablas, double drum Dholak and the castanets Kartâl). Thanks to the aerial glissandi of the Mohan Veena and the shimmering lyricism of the Gipsys, this meeting has created a powerful and bright music. Recorded in an obvious magical one shot elan, the record combines pagan and divine love songs, which were taken from an ancestral songbook. This meeting, which is halfway between savant hindoustani art, folk traditions of the Thar desert and an elegant modernity, is a musical jewel." 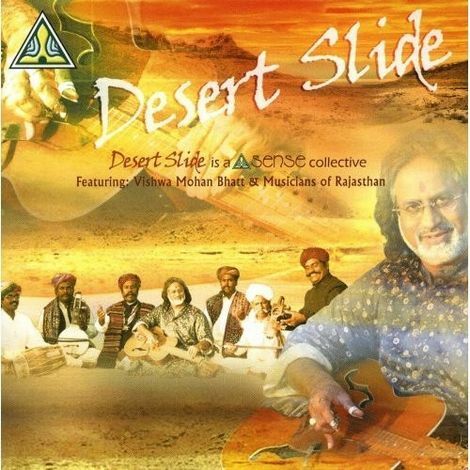 "Desert Slide" is a new Sense World Music collective featuring Grammy award winner Vishwa Mohan Bhatt (V M Bhatt) playing the Mohan Veena (Indian slide guitar) and a selection of the crème de la crème of the Desert musicians of Rajasthan. The combination of the mesmerising artistry of Bhatt and the soaring passion of vocalist Anwar Khan coupled with the driving hypnotic rhythms of Dholak, Khadtal and the desert strings of Kamaicha and Sindhi Sarangi produces a level of involvement for musician and listener alike which is so engrossing it seems to induce a trance like state. This joyful, deeply spiritual and intense musical experience is also something really special to be part of at a live concert event. Vishwa Mohan Bhatt who is also from Jaipur in Rajasthan shot to prominence in the west with his collaboration with Ry Cooder called 'Meeting by the River' and this new ensemble looks set to win over audiences worldwide with its unique blend of musical influences. The group arose from previous collaborations between the musicians and has borne fruit in their new recording for Sense. The opening devotional song Helo Mharo Suno is kin to the bhajan form of Hindu hymn. It is in praise of one of Rajasthan's most revered Hindu deities and Islamic pirs (saints) of medieval times. Said to have lived from 1469 to 1575, Baba Ramdev is linked with the Pokaran district, some 110 km east of Jelsalmer in western Rajasthan and is often depicted on horseback. His worship crosses the Hindu-Muslim divide as well as crossing the caste line since his followers include caste Hindus and the casteless (Dalits or Untouchables) in modern-day Rajasthan and Gujarat -and even further afield into Madhya Pradesh and Sind on the Pakistani side of the border. Several Rajasthani melas (fairs or festivals) celebrate his memory. Helo Mharo Suno is rooted in rãg Bageshri with a sprinkle of Shahana and appears in an eight-beat tãl (rhythm cycle). Its title can be rendered along the lines of 'Hear me calling you' or 'Hear my entreaty'. The style of singing is designed to attract attention. Avalu Thari Aave, Badilo Ghar Aave (track 2) is a song of separation, a woman's plea to her beloved (badilo), asking him to come home (ghar). Vishwa Mohan Bhatt plays a theme, a rhythmic melodic hook of his own composition early in the piece to convey a sense of journeying, but the wit of his playing lies in slipping between the interstices of 'ragadom'. The interpretation is based in rãg Bhairav with a little trace of Kalingra, another morning rãg, again in the same 8-beat tãl, keherwa or kaharwa as Helo mharo suno. The portrait painted uses filigree brushstrokes, impressionistically summoning the two rãgs' slight difference. Jhilmil Barse Meh (track 3) is a rainy season song. In Rajasthani 'meh' means rain, a word perhaps related to the Hindi 'megh' (cloud) - hence the monsoon season rãg Megh. 'Barse' means 'pouring' while 'jhilmil' indicates something tiny or small, so the line can be translated as 'Droplets of rain are falling'. The song is based in Malhar, a monsoon season rãg, and Des, a rãg with a Malhar feel. It is, so to speak, Des with a wash of Malhar - as distinct from Des Malhar, another rãg permutation. Again, like all the pieces except Kesariya balam, it is in keherwa. All languages love onomatopoeia. Rajasthani is no exception. In track 4, 'Hichki' (Hiccoughs) hinges on a local folk belief or superstition. When a person thinks of somebody from whom they are apart, the person he or she is missing is said to get the hiccups. The narrator has got the hiccups. In Rajasthan the rãg it is set in is commonly called Bhairavi but it is actually truer to Kirvani, a rãg originally associated with the South Indian heartland. Vishwa Mohan Bhatt's alap or opening invocation is designed to set the mood or scene, creating an atmosphere suffused with sadness or melancholy and a pain and pangs of separation. It also has a romantic undertow strong enough to whip the listener off their feet. Mhari Menhdi Ro Rang (track 5) (The colour of my henna) is set in Pahadi. Pahadi here is more like a dhun or folk air than a pure rãg. Distinguishing it from a strict rãg, Bhatt likes to label it a "dhun Pahadi". The programme's instinctive mela sub-theme resurfaces here. In Rajasthan, but also elsewhere in the Indian subcontinent, menhdi or henna's uses range from the cosmetic - it is a hair colorant used by men and women alike - to rites of passage. It is particularly associated with bridal adornment and is used to dye intricate patterns on celebrants' hands. Henna is also associated with typically Rajasthani melas. One such is the monsoon-season Teej, the festival of swings, in the Hindu month of Shravana (August-time in the Christian calendar) which toasts Parvati's union with Shiva and hence conjugal bliss. Another is Gangaur, Rajasthan's defining 18-day mela that follows on the heels of Holi, the spring festival of colours, and a mela that, like Teej, is connected with the Goddess Parvati. Henna's earthy browns and reds are the colours from which life - and, symbolically, green - springs. Kesariya Balam (track 6) or Saffron Beloved - imagine the colour of kesar mangos - is another song of longing and separation. It is in the 6-beat dadra tãl and set in Mand, a rãg borrowed from the folk music of Rajasthan. The lyrics welcome the listener to the person's home or homeland. The singer sings of counting the days, counting off the days that they have been apart, on the finger joints of the outstretched palm. She has done this so frequently and for so long that the lines of the skin creases are wearing away. Rajasthan's vastness of bright light and vibrant colour is reflected in its folk arts and the land's robust musical heritage. That intensity and the sheer size of the state determine that it is a land of extremes. It embraces the camel browns and kesar yellows of the Thar Desert on its western flank and - pointing east towards Uttar Pradesh - the grey plumage and black heads of demoiselle cranes soaring over Jaipur, the Pink City, descending to dance and inspire dancers. Desert Slide reflects the excitement of its birthplace, its surroundings, its musical origins and the colours of Rajasthan. In its bridging of tradition, nothing like Desert Slide has ever been captured for posterity before and that is why Helo mharo suno in its invocation of Baba Ramdev is so perfect. He banished boundaries in Rajasthan. Maybe only a white writer would have dared make those connections."